At about 2:00 or so the day of a potluck party, the time was winding down for making something and I just started thinking about what I should make (sense a theme here?). I don’t claim to be a tremendously well-prepared person, but I like to reassure myself that my heart’s in the right place. I poked through my cookbooks, perused the internet, and called Nicole for good measure. Finally, I hit on something potluck acceptable: Pork and Pumpkin Chili. It can sit forever in a slow cooker, is thick, satisfying and feeds a crowd… or feeds me for days on end. The recipe I usually use, courtesy of the Food Network, has beer and sour cream in it. The beer adds a dimension to the chili that I didn’t want to get rid of, but I couldn’t think of anything that would be an acceptable substitute (aside from gluten free beer). Since many of the people attending the party are gluten-intolerant or trying to remove it from their diets, it seemed inconsiderate, or at least counter-productive, to make something that only half of them would be able to eat. As I wandered the aisles of the grocery store, at oh 3:00 or so (I’m such a planner), talking to my mom on the phone, she suggested that apple juice would provide the necessary tang and acidity if I swapped it in for the beer. I thought it would be too sweet, so I momentarily discarded the idea. As I stood in the beer aisle, willing gluten free beer to magically present itself on the shelf, I spied some Angry Orchard hard cider. Aha! Mom you were right all along! The hard cider provided the acidity and some of the flavor dimension while removing the gluten in the beer. I’ve streamlined the recipe in other ways as well, as it called for 2-3 chipotles in adobo sauce. Recipes that call for 1/4 of a can of something always bug me. It’s almost the same as saying, “chop two canned chipotle peppers in adobo sauce, and refrigerate remainder of can until fuzzy.” BUT if you have a creative way to use up 3/4 of a can of chipotle peppers, I’m all ears. In lieu of canned chipotles, I found some dried chipotles that I coarsely chopped up which was much easier than fishing around in the somewhat dubious adobo sauce. Am I the only person who thinks this? Substituting the sour cream was a sight easier, as I’ve hit on this method before in the Pork and Green Chile Stew I shared with you. I simply refrigerated a can of coconut milk and pulled out the creamy solids from the top to make a pumpkin spiced crema to dollop on top of the chili. This isn’t terribly necessary for the overall success of the dish, but I think the warmly spiced, creamy pumpkin flavor melting into the chili just makes it all the more satisfying. There you have it folks, a gluten-free, spicy fall/winter favorite that made it to the party… just the teeniest bit late. PS This is also why I only have one picture to share with you for this recipe, I wasn’t even planning on blogging about it, but I snapped this rather sloppy picture at the last second just before I added the mustard greens. First put your coconut milk in the fridge. Combine the stock, cider, chopped chipotles, pepper and a generous sprinkle of salt in a dutch oven and bring it to a boil. When it is at a gentle boil, turn down to a simmer. Melt your butter or lard in a cast iron skillet and when hot, add pork cubes. Brown them on all sides and put in a dutch oven (I’m giving you the “I’m in a hurry” version, as, by this time, the potluck was supposed to start in about an hour and a half, and who doesn’t appreciate shortcuts anyway?). When the pork is seared on all sides, put it in the dutch oven with the simmering water. Cover and allow to simmer for another 15-20 minutes. Use the remaining fat in your pan to saute the onions and garlic until softened, about 5 more minutes, and then add them to the pot along with the chopped poblanos. Add your oregano, chili powder, and cinnamon to the broth, and taste. Season with salt and pepper if needed. Optional: The “canned” taste of pumpkin can be a turn off to some people, so I borrowed this technique from America’s Test Kitchen’s Pumpkin Pie recipe to give it a little more depth. By all means, if you’re in a hurry, skip this step. Open the can of pumpkin, and, while the onions are softening, warm in a sauce pan over medium low heat, stirring frequently, about five minutes or so. Don’t leave it or it’ll burn. Reserve two tablespoons of the pumpkin and allow to cool (or just remove straight from the can). 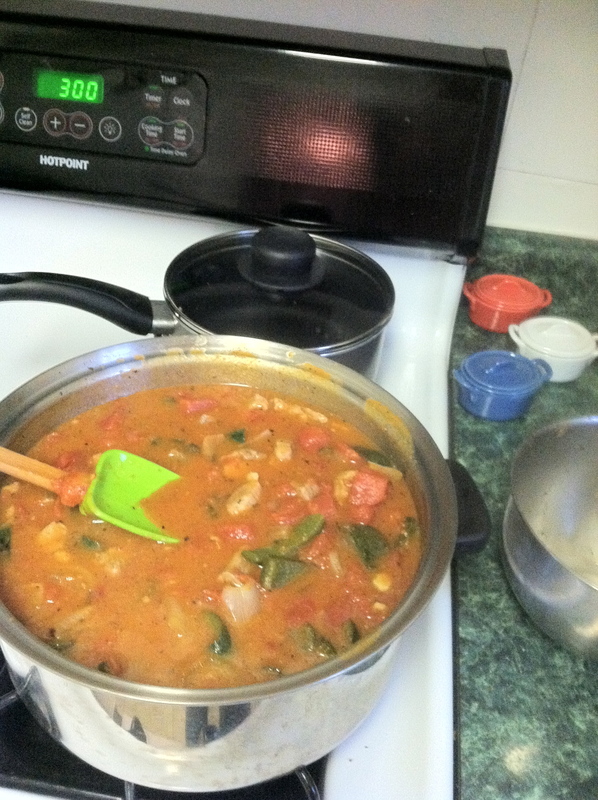 Add the canned pumpkin and the tomatoes to the pot, directly after the poblanos and seasonings. In the meantime, open the cold coconut milk and remove the solids from the top of the can. Combine in a small bowl with the reserved pumpkin, cinnamon and a pinch of salt. You can add a drizzle of honey (a tiny bit) if you want to this mixture. Put it back in the fridge. About five minutes before you’re ready to serve, add the mustard greens, coarsely chopped, to the pot. This entry was posted in main dish, pork, soup and tagged chili, coconut milk, crema, hard cider, pork, pumpkin. Bookmark the permalink.